The Regatta Homes are ideally located across from Pacific Coast Highway and within walking distance to Strands Beach and the newer Dana Point Nature Center. A gated community, right next to the Cape Cove community, the neighborhood also offers association pool and spa facilities and quiet streets, plus walking distance to RH Dana Elementary School. Due to their location, many Regatta properties have ocean, harbor, Catalina Island and white water views. Search all Regatta Homes currently listed for sale in the MLS including those listed as short sales and foreclosures. For more information about any of these Regatta Homes, please contact us at (949) 888-6788 or read more about the Regatta Real Estate options. For other homes in the area, visit our Dana Point Real Estate section, including homes in Monarch Beach. The Regatta Real Estate is compromised of about 119 single family homes, the community has a wonderful pool, spa and lounging area. An unbeatable location with lots of privacy, great community ammenities, close to excellent schools, Dana Point Harbor and all the perks of living steps away from world class beaches. The homes have three bedrooms, two or two and a half bathrooms, two car garages design and go from single levels, to tri level homes, and 1500 sq ft to 2100 sq ft in size. 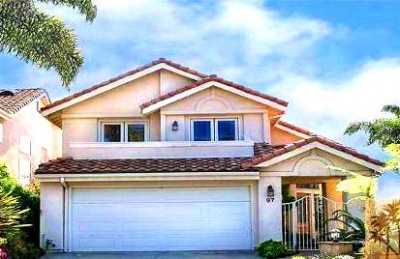 OCExecutives specializes in real estate transactions of Regatta Homes in Dana Point, California. Contact us today to sell real estate or buy real estate in the Regatta community of Dana Point or for more information about any of these Regatta homes. If you would like to see a list of homes in other communities in Monarch Beach or Dana Point, follow the links above, or click here for other Dana Point Real Estate.